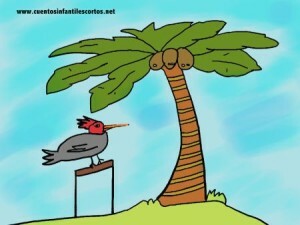 Once upon a time there was a woodpecker called Peter who lived in a big jungle full of trees including coconut palms. Peter really liked coconut palms because of their big leaves and of course, because of their fruit: The coconut. He saw liquid running out of the coconut, and was surprised by the white colour on the inside so different from the brown husk. Peter tasted the coconut and loved its flavour. So coconut became his favorite fruit. But there was a bit of a problem. He had to wait until a monkey threw a coconut to the ground, otherwise he wouldn’t be able to break the hard brown husk to eat the white coconut inside. One day Peter was tired of waiting for the monkeys to eat his favorite fruit, so he had an idea: “If I peck at the leaves the coconut might fall down to the ground and I won´t need the monkeys any more”. And so he did and it worked! So, from that moment on, Peter never had to depend on monkeys to eat coconut anymore.